Combining a wealth of motorsport experience together with a team of highly-skilled personnel and an extensive range of engineering resources, the JRM Group is a rapidly developing force in the automotive performance and motorsport industries. The group operate at the cutting edge of motorsport and have an enviable record of success under the JRM Racing banner. Significant motorsport achievements include winning the 2010 British Rally Championship title, ahead of further achievements in circuit racing including the 2011 FIA GT1 Drivers World Championship and collecting the Tourist Trophy. In 2012, JRM Racing finished sixth place overall at Le Mans in the LMP1 category, the highest echelon within sportscar racing. Third party engineering is an integral part of the JRM Group activities. The Groups’ purpose-built Daventry workshop is equipped with state-of-the-art CNC machine tools and is able to assure the highest standards of engineering to meet exacting customer demands and delivery timescales. An Introduction to the Bowers MicroGaugeUsing the latest CAD CAM software, JRM is able to compress the time from design to manufacture via a tried, tested and rapid prototyping procedure, through to the production and delivery of fully inspected and traceable finished components. Working to exceptionally precise tolerances, the company offers the ability to produce complex components in a wide-range of materials, including aluminium, stainless steel, plastics and special alloys. JRM regards quality as the most important part of the engineering process. The company is ISO 9001:2008 certified, accreditation to this internationally accepted standard helps to guarantee that work is produced consistently, on time and on specification. Typical of JRM’s determination to remain at the forefront of Inspection technology is the company’s recent purchase of an advanced MicroGauge bore gauging system from Bowers Metrology. Phil Paul, Head of Inspection at the JRM Group, explained: “As the difference between success and failure within motorsport is often measured in milliseconds, and given that component failure on the track is to be avoided at all costs, JRM pay exhaustive attention to all of our inspection activities. “Although accurate bore gauges for measuring larger sizes have been available for many years, the news that Bowers had launched a range of digital instruments that were able to precisely measure smaller bores prompted me to request a demonstration. The results of the demo, performed on some of our smaller, more difficult to measure bores, convinced us to invest in the new Bowers gauges. Bowers Metrology’s recently launched MicroGauge bore gauging system was designed in response to frequent requests from the company’s global customer base. The unanimous requirement was for an accurate bore gauging system that could precisely measure bores within the 1.0 - 6.0 mm range. Excellent early sales levels of the compact 2-point digital gauge, in both domestic and global marketplaces, have justified the development of the ingenious Bowers instrument. Featuring a completely new integral digital readout, the user friendly instrument could not be easier to use. The action of locating the gauge’s hard-chromed, spherical contact points into the bore to be measured causes a mechanical force to be transferred to the gauge’s digital readout unit. This displacement instantaneously results in the bore’s size being displayed on the unit’s high-visibility LCD readout. Moreover, as the MicroGauge benefits from 2-point localised contact with the bore to be measured, further bore features, such as ovality, taper and barrelling can also be evaluated. Access to the new bore gauge’s functions, including set/calibrate, metric/inch conversion and choice of 0.010 or 0.001 mm resolutions, is via two buttons. Whilst data transfer can be carried-out via Proximity-RS232 or Proximity-USB outputs. As with all Bowers bore-gauging products, the new MicroGauge is available as an individual instrument, or as a set encompassing a selection of various size measuring heads and setting rings, allowing a range of diameters to be measured. All MicroGauge setting rings are supplied with fully traceable UKAS certification as standard, enabling MicroGauge to be included on users’ gauge calibration systems and utilised from the day of delivery. 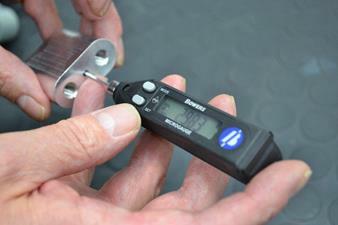 For more information on the Bowers MicroGauge click here, alternatively watch the video.